At SAC 2009, Misoczki and Barreto proposed a new class of codes, which have parity-check matrices that are quasi-dyadic. A special subclass of these codes were shown to coincide with Goppa codes and those were recommended for cryptosystems based on error-correcting codes. 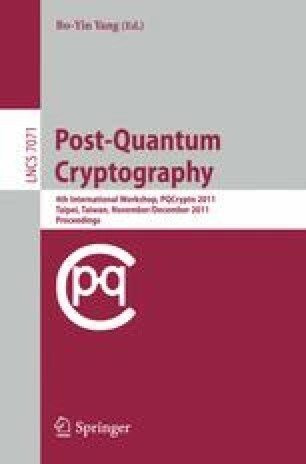 Quasi-dyadic codes have both very compact representations and allow for efficient processing, resulting in fast cryptosystems with small key sizes. In this paper, we generalize these results and introduce quasi-monoidic codes, which retain all desirable properties of quasi-dyadic codes. We show that, as before, a subclass of our codes contains only Goppa codes or, for a slightly bigger subclass, only Generalized Srivastava codes. Unlike before, we also capture codes over fields of odd characteristic. These include wild Goppa codes that were proposed at SAC 2010 by Bernstein, Lange, and Peters for their exceptional error-correction capabilities. We show how to instantiate standard code-based encryption and signature schemes with our codes and give some preliminary parameters.